Middle Georgia golf enthusiasts will tee off during a tournament fundraiser that supports Fort Valley State University’s football program. 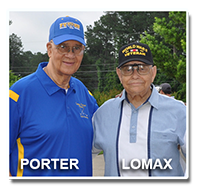 The seventh annual Lomax-Porter Golf Tournament takes place on June 11, 2016 at the Cherokee Pines Golf and Fitness Club. The annual event is a major fundraiser for Wildcats football and is held in honor of legendary FVSU coaches Stan Lomax and Douglas Porter. On the fairway, golfers will compete for cash prizes and bragging rights. This year’s tournament format is four person team scramble with a shotgun start at 9 a.m. Registration begins at 7:30 a.m. and the first, second, and third place winners will receive cash prizes. The tournament is hosted by Fort Valley State University’s Department of Intercollegiate Athletics, the Growl Club and Wildcat Nation. To purchase tickets, contact the FVSU Foundation, Inc, (478)825-6474. Please contact the FVSU Department of Intercollegiate Athletics, (478) 825-6669, if you have questions. Tickets are $75 per person or $300 per team. To support the event, visit the FVSU Foundation, Inc., 1005 State University Drive, Fort Valley, Ga. 31030-4313 or call (478) 825-6474. Download the 2016 brochure by clicking here. View pictures from the 2015 tournament on Flickr. Contact the Fort Valley State University Foundation, Inc. at (478) 825-6474. Please make your gift payable to the FVSU Foundation, Inc., earmarked for the Football Program-Unrestricted. Fort Valley State University Foundation, Inc.